Art = Life at R.L. Delight Fine Art: 30/30 Challenge: Day 20: Wave Study #77? 30/30 Challenge: Day 20: Wave Study #77? I have lost track of what number wave study I am on! Part of the problem is my wave studies and coastal/beachscape studies sort of blur the lines. 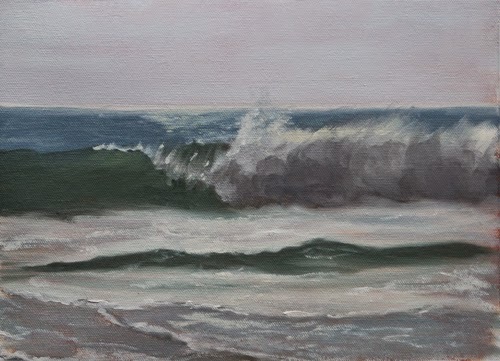 I do consider a painting that only has waves a wave study. Others that have wave and rocks I determine by the intent or focus. I will have to check a bit more carefully and give the official number of this wave study later. We had a wonderful few days this week enjoying the company of a dear visitor whom we have not seen in many many years. I took yesterday to regroup after our visitor left and we took a rare morning this morning sleeping in a bit. It was too late to get out to get the morning light as it hits the waves so I decided to go for an afternoon painting. It is the last day of summer and unusually warm here on the northern Oregon coast, again. 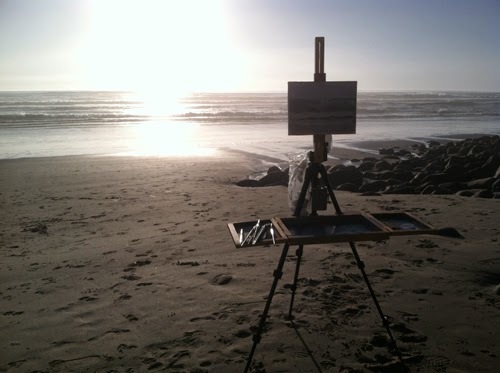 I went down to the beach at 4:00 pm to paint and there wasn't any wind. It was beautifully warm and misty. The waves were fairly large, 7.5-8 ft. I had a brief moment of deciding between painting Neahkahnie mountain or the waves. Neahkahnie was obscured by a bright mist so, waves it was. The waves probably would have won out regardless as they were quite stunning. Color is a bit challenging to see as the sun sinks behind the waves. I also didn't have much time to get this wave and spent about an hour and a half on it. Tricky lighting. As I was working with a 9"x12" canvas, I had to work pretty fast. There are several things I am not exactly happy with. I didn't quite nail the atmospheric effect the warm sun was causing. I also didn't quite get the dazzling bright light on the water to my satisfaction. The wave shadows were quite dramatic and the color and tone is not quite right. The edges also need to be softened. I am pleased that I captured enough of the scene to give me good information for future use. I am fairly happy with some of the detail elements too in spite of not really having time for much detail. I had fun experimenting with subtle color in the shadows and I am enjoying working in the slightly larger format. The tide had turned toward the end and was coming up at a rather alarming rate due to the large waves. The tide and light pretty much limited the length of painting time. What a beautiful day! Wow! These have gotten really good! You should be happy with your progress! Thank you for the lovely comment! I am generally happy with my progress, and I am also pushing harder for continuing progress. Onward! Day 5: 30/30 Challenge: Hot Sands!